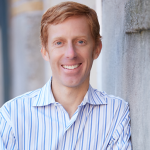 Recently, I had the pleasure of meeting Ross Beyler, the head of Growth Spark in Cambridge, and he shared with me his thoughts on how companies in today’s online world can be successful. What I liked about his philosophy is that it is very simple to employ for any online company that wants to increase their traffic and sales. He echoed a lot of this in a recent post from his company’s site and I wanted to share it with you all because it focuses on the data points that really matter. Please enjoy…. How do I get more website visitors to make a purchase? How do I efficiently deliver products to my customers? How do I get customers to make repeat purchases? 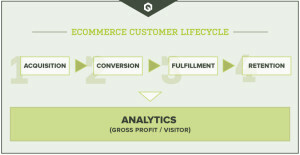 It’s easy to see how these four questions relate to what are considered the most important metrics behind a successful ecommerce strategy: number of unique visitors, conversion rate, gross margin and percentage of repeat buyers. Above all of these metrics, however, is the one number we’ve seen as the ‘holy grail’ in determining marketing spend and customer value: Gross Profit per Visitor. Acquisition focuses on tactics that will drive visitors to your website. Popular tactics include search engine optimization, paid-search, social media and affiliate marketing. Successful companies pay close attention to the cost associated with each of these tactics / channels and to the conversion rate produced by each. Conversion focuses on getting the visitors of your website to purchase products. This step is where user experience design, branding, content and your on-site strategy are crucial. Success is measured by conversion rate. Fulfillment focuses on getting products in the hand of your customers as quickly and efficiently as possible. Technology has become an important element in coordinate shipping from multiple vendors / warehouses, managing inventory across multiple channels and calculating shipping effectively. The proper operations system can save companies huge margins on fulfillment. Retention focuses on getting customers to continue coming back and purchasing products. Relationship management is essential and driven by marketing automation platforms, loyalty programs and referral incentives. What we feel is the REAL differentiator with this framework, however, is the underlying / unifying concept of Gross Profit / Visitor (GP/V). GP/V is a metric ecommerce companies can utilize to understand the profitability of each visitor and visitor segment (i.e. geographic target, demographic target, specific traffic source, etc.). In turn, this metric can also be utilized to calculate the ‘drivers’ behind the profitability of their business. If we see higher GP/V for certain segments, such as customers coming to the site via Social Media vs SEO, we can then modify our Acquisition strategy to leverage Social Media further.